In the beginning of May, 2016 a wildfire swept through the Regional Municipality of Wood Buffalo (RMWB) including the City of Fort McMurray. In disasters such as this, it is important to note that economic developers also have a critical role in economic and business recovery. By helping to get businesses back on their feet, livelihoods are restored, and business and economic recovery efforts are accelerated. EDA stepped in during this crisis and using its Economic Disaster Recovery Program (EDRP) as a template, began to provide additional leadership and experience the RMWB needed to assist them in their business and economic recovery efforts. Our efforts culminated in a report for the Regional Municipality of Wood Buffalo. 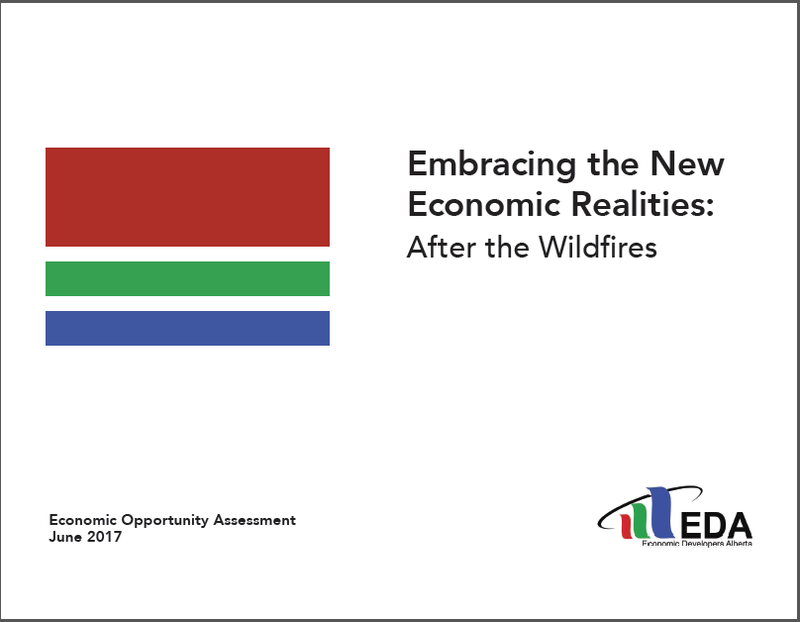 Called "Embracing the New Economic Realities: After the Wildfires" it is a consolidation of feedback from over 200 business and stakeholder interviews; and includes over 50 immediate, short, medium and long-term recommendations specific to business and economic recovery and growth throughout the region. Read this article in Fort McMurray Today about the recommendations in our report. There were two others stages in our plan to assist the Regional Municipality of Wood Buffalo (RMWB). On May 30, 2016, EDA established the Wood Buffalo Business Recovery Hotline in Calgary, Alberta. The Hotline was designed to register small businesses, gather information about their immediate needs and provide access to various resources, including providing emergency financial relief on behalf of the Canadian Red Cross. The Hotline was developed and operated by EDA, in close collaboration with the RMWB. In January 2017 EDA led a 10-member Economic Opportunity Assessment Team to Fort McMurray. Comprised of volunteer economic development experts from the U.S. and Canada, the team conducted a qualitative assessment and unbiased review of the key economic challenges the RMWB was facing; and identified where opportunities exist to improve the economic outlook moving forward. Learn More about the members of the Economic Opportunity Assessment Team participating in this project.